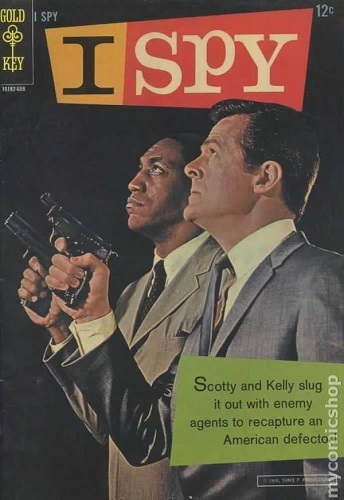 SATURDAY COMICS - "I SPY"
'I Spy' is an American television secret-agent buddy adventure series. 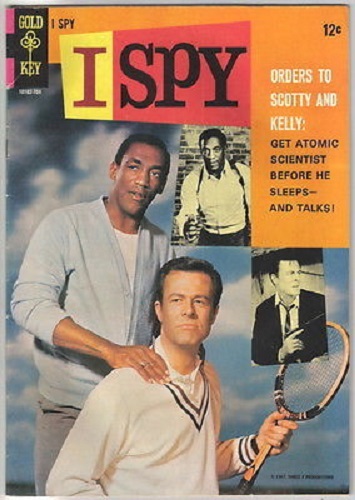 It ran for three seasons on NBC from 1965 to 1968 and teamed US intelligence agents Kelly Robinson (Robert Culp) and Alexander "Scotty" Scott (Bill Cosby), traveling under cover as international "tennis bums". Robinson poses as an amateur with Scott as his trainer, playing against wealthy opponents in return for food and lodging. 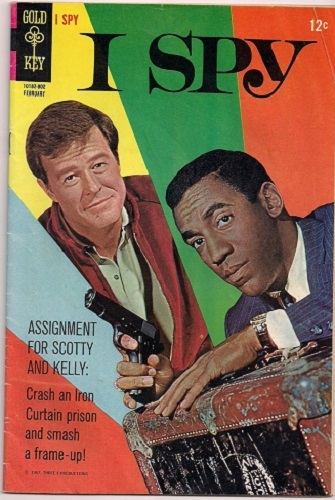 Their work involved chasing villains, spies, and beautiful women. I do my best to keep the characters separate from the actors who portray them. So I'm not going to turn my back on what was a great action series just because one of its stars is allegedly a sexual abuser. 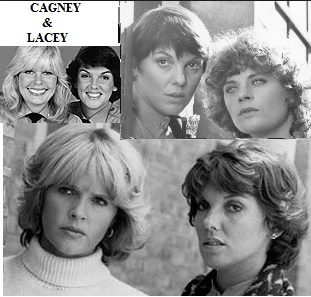 'Cagney & Lacey' is an American television series that originally aired on the CBS television network for seven seasons from March 25, 1982 to May 16, 1988. 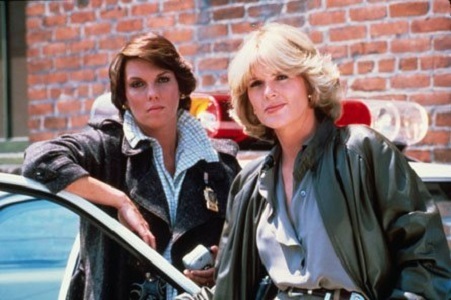 A police procedural, the show stars Tyne Daly and Sharon Gless as New York City police detectives who lead very different lives: Christine Cagney (Gless) was a single, career-minded woman, while Mary Beth Lacey (Daly) was a married working mother. The series was set in a fictionalized version of Manhattan's 14th Precinct (known as "Midtown South"). 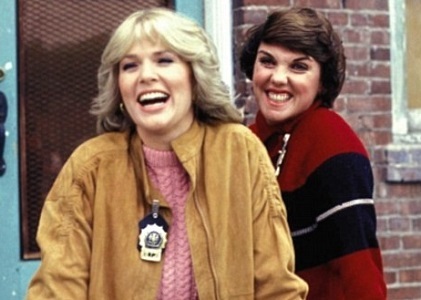 For six consecutive years, one of the two lead actresses won the Emmy for Best Lead Actress in a Drama (four wins for Daly, two for Gless), a winning streak unmatched in any major category by a show. And that's how the show will always be remembered. 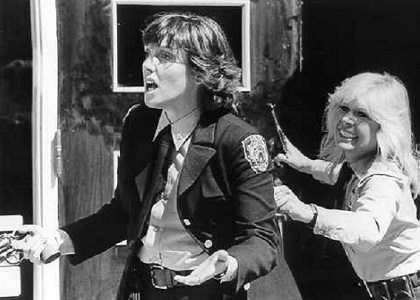 But the role of Chris Cagney was not always played by Sharon Gless. 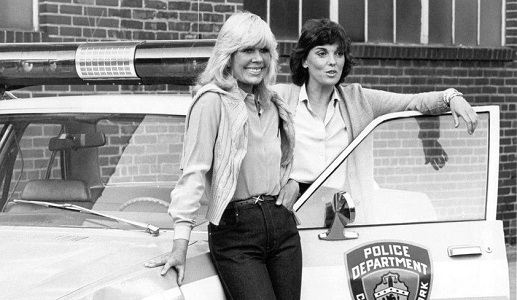 It all began with a pilot film starring Tyne Daly as Mary Beth Lacey, but it was Loretta Swit who played her partner. Unfortunately for her, the Powers That Be behind 'M*A*S*H' would not let Swit out of her contract in order to take part in the series. 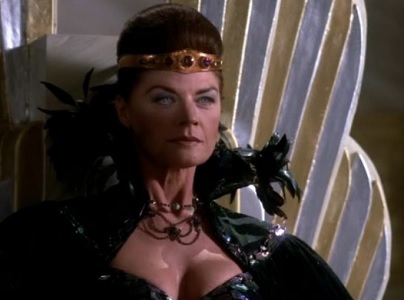 So the role was recast with Meg Foster. 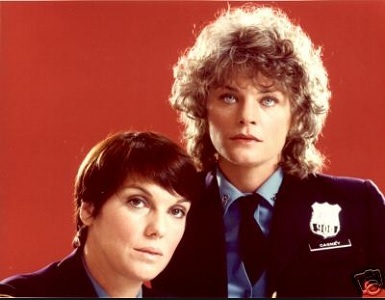 But Ms. Foster only appeared in the first six episodes arc of the series as a mid-season replacement before the role was recast yet again with Ms. Gless. And the rest, as they say, is History. Regarding the casting of Loretta Swit in the role, that's a softball splainin. That pilot movie is shipped off to Toobworld-MOTW, where many of the TV movies which just don't fit into Earth Prime-Time can also be found. And with this Recastaway conundrum, that's the best of all possible Toobworlds for it. Normally I would have cited Occam's Razor on this recasting and gone for the simplest splainin: Those first six episodes took place in that Prequel Toobworld while the remaining bulk of the series claims residence in Earth Prime-Time, the main Toobworld. But in this case, I wanted to take on the challenge of keeping it in the main Toobworld along with the Gless episodes. I felt something more was needed to give the Toobworld Dynamic some of that TV pizazz. It needed a flashier splainin for the Recastaway to keep those first six episodes in Toobworld Prime. Something along the lines of a temporary alien replacement. 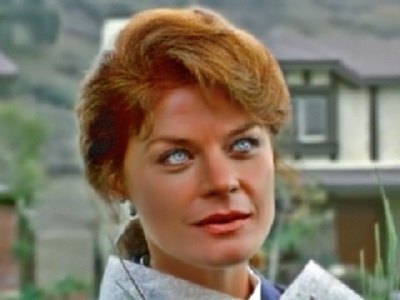 And it's all because of those hypnotic eyes of Meg Foster. 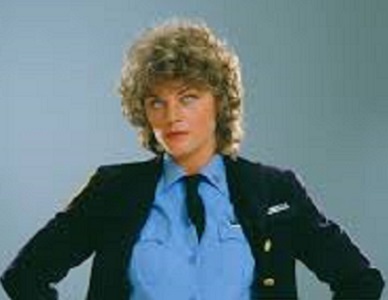 Foster has always been stunning with the bluest eyes imaginable. They are practically unearthly! So it was not hard to then imagine that it was an alien who stole Chris Cagney's identity for a few weeks before finally abandoning the ruse and the real Chris Cagney was able to return. But which alien? Surely it should be an alien whom Ms. Foster had already played in Toobworld. And that's why I'm going to claim that for a few weeks, Detective Chris Cagney was impersonated by Hera, the Greek demi-goddess and errant wife of Zeus. You may not ever have considered it, but Hera - as well as all of the demi-gods of mythology (not just the Greek pantheon) - were aliens not of Earth Prime-Time. They were - are! 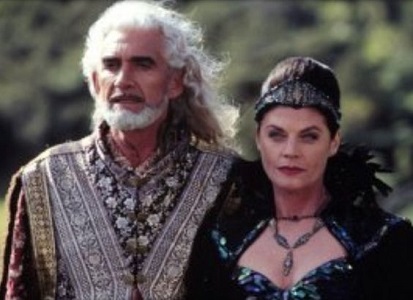 - pan-dimensional beings who crossed over from their home dimension to establish dominion on Toobworld. 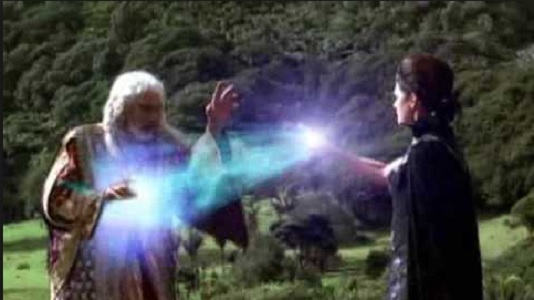 Some ruled from their seat of power at the locus for the multi-dimensional rift near Mount Olympus; others held sway in the "great white North" of Asgard accessible by the burning rainbow bridge of Bifrost. I can't speak for all the fictional universes created from Mankind's collective imagination, but for Toobworld, those demi-gods still exist as do their half-breed human spawn like Hercules. 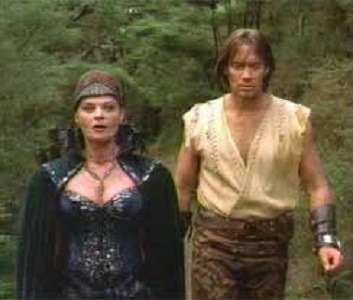 (In Toobworld today, Hercules hides in plain sight as the actor Kevin Sorbo.) Some of those demi-gods, like Apollo, will still be around somewhere in the galaxy centuries from now. But I think it more likely that the demi-goddess felt the need to be an avenger for a period of time, to make right what once went wrong. Perhaps she was atoning for some past transgression by this action. And so Hera chose to do her penance in the guise of a detective in the NYPD. 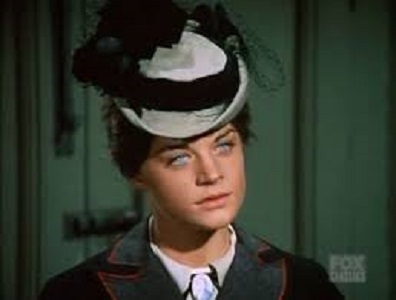 She used her magicks to abscond with the real Chris Cagney and hold her as a (hopefully!) pampered prisoner while she impersonated the policewoman. And neither Chris' partner Mary Beth Lacey, nor Lt. Samuels or any of the other detectives in the squad - Isbecki, La Guardia, or Rob Petrie's third cousin Mark - ever noticed the change. Like most of the demi-gods, Hera had the talent to alter her appearance and so to everybody else she looked just like Christine Cagney. But because we saw this all play out from our position in the Trueniverse, our perspective showed us Hera as she truly looked. It would be much the same situation years later when we saw Dr. Sam Beckett leap into the lives of various people at different points in his own personal timeline. No matter who they were, we only saw them as they truly looked whenever we saw their reflection. Otherwise, we saw Sam Beckett. That's my splainin and I'm sticking with it. 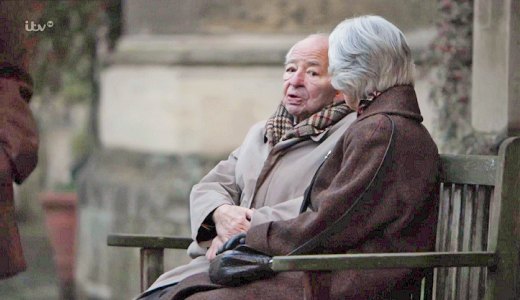 Colin Dexter, a British mystery writer whose irascible, poetry-loving detective, Chief Inspector Morse, pursued clues and cask-conditioned ale through 13 novels and a popular television series, died on Tuesday at his home in Oxford, England. He was 86. 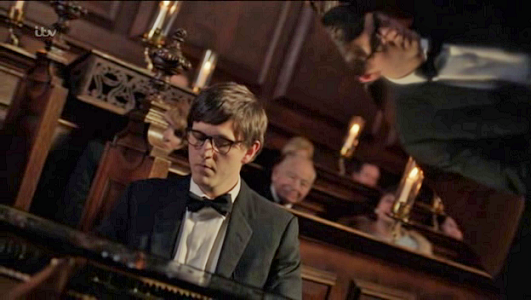 As far as the televersion of 'Inspector Morse', his younger self 'Endeavour', and his successor and former partner 'Inspector Lewis' are concerned, the quirks of the stories from the books (Morse's love of drink, Wagner, and crossword puzzles) were enhanced by a new addition - Hitchcock-like cameo appearances by Colin Dexter. There is a great site about Morse online which covers all three TV series. 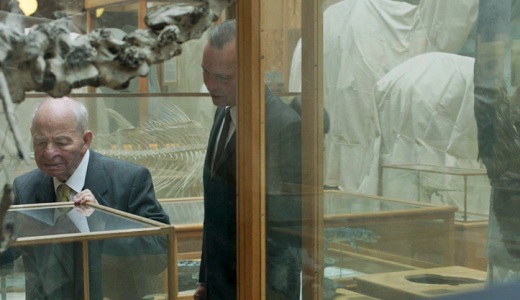 The curator of "Morse, Lewis, and Endeavour" put together a couple of videos featuring the collection of those cameos by Mr. Dexter. Here are those videos as found at YouTube, but you should also visit that site if you're a fan of Morse. Here's a second version. I think the addition of a running soundtrack warranted the new version? Here's a quick guide to the 'Morse' appearances you might want to keep handy while watching the reruns. 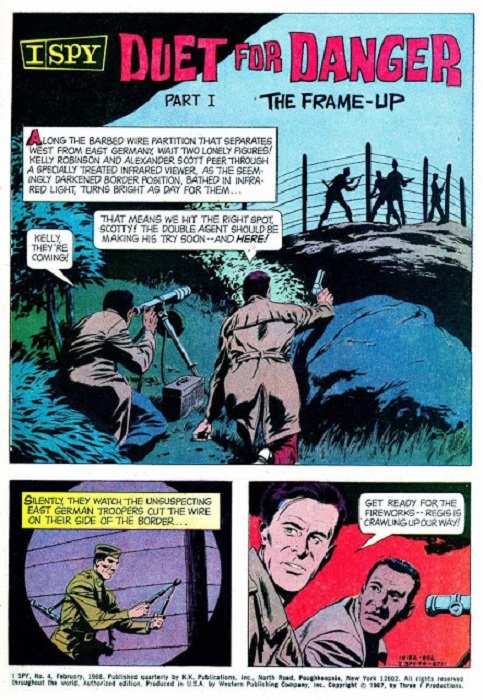 The numbers given refer to the point in time at which Mr. Dexter makes his appearance in the episode. 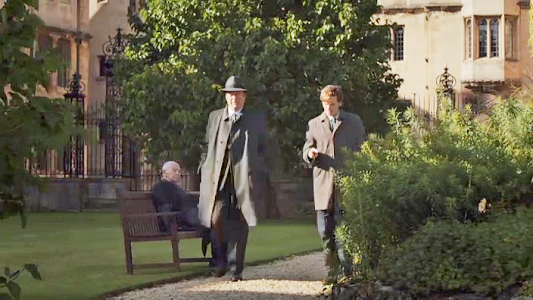 With this last appearance in 'Inspector Morse', Dexter could be playing himself. However, he's part of a tour which suggests he came from a distance. 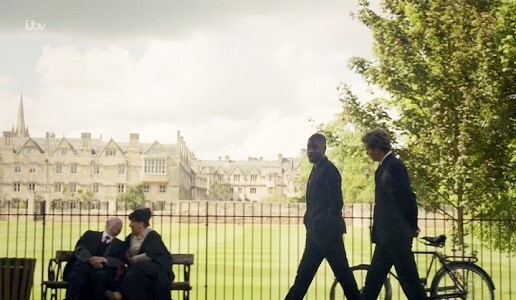 Living in the area, he had no problem puttering around the various colleges (both real and fictional) on his own as seen in earlier episodes. It could be he was a separate character, but I'm going to cite Occam's Razor: he was Colin Dexter, still recovering from the leg injury which splains away the wheelchair. And traveling with a tour group just made it easier on him that way. 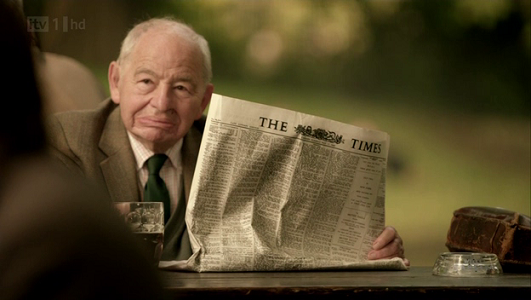 Colin Dexter must have had a relapse with that leg injury he suffered in the earlier series. 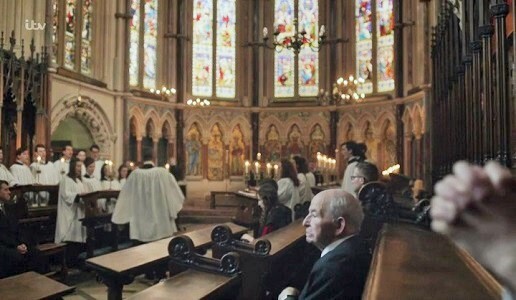 For many of those quick glimpses in both series, we can assume that we are seeing Colin Dexter as his own televersion. After all, the real world Dexter lived in the Oxford area since 1966. And having retired in the mid-1980s, he had plenty of free time to indulge in the various plays and operas, visiting museum exhibits, and even spraining or even breaking his leg so that he had to go to the clinic for a check-up. But then what are we to make of the times when he showed up in these guises? The same question could be asked of these appearances in the sequel. To tidy it up, I would suggest that each appearance by Dexter as the college don would be the same man in both series, and the same could be said for all of his appearances as the porter. But that still leaves the Bishop, the Doctor, the Prisoner, and the Tramp. We can tighten it up a bit more. Dexter was seen as the Tramp in "Happy Families" before he was seen as the Prisoner in "Absolute Conviction". So let's assume the tramp was arrested for vagrancy and serving a prison term. That brings down the number to three, the Bishop, the Doctor, and the Prisoner/Tramp. Each of these men had sons of their own who grew up to resemble their fathers and thus each other. Whereas their fathers were maternal twins, their sons fell into that accepted Toobworld category of identical cousins. 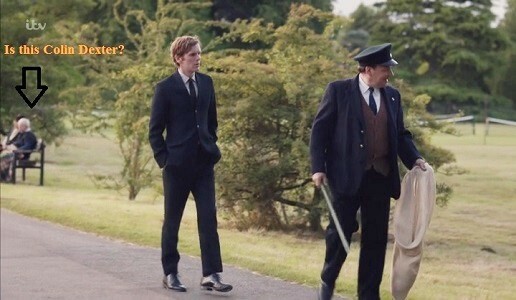 Young men in their thirties during the time period of 'Endeavour', they grew up to follow in their fathers' footsteps - one as a porter and the other as a Don, the two men seen in episodes of 'Inspector Morse' and 'Inspector Lewis'. All four characters were of the same age as Colin Dexter, but obviously only the sons were born around the same time as the writer. The fathers, being the age of Dexter later in life, would have to have a corresponding birth date. Thus, the twins were born around 1883, making them each about 47 when their sons were born. This still leaves us with the doppelgangers of the Bishop, Doctor, and the Tramp/Prisoner. Ah.... now we get supernatural, Occam's Razor be damned! 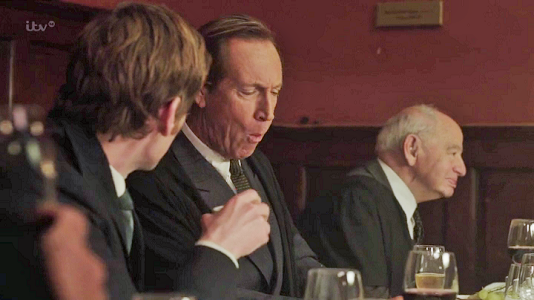 But to make the splainin as simple as possible - Both of those Colin Dexter characters from 'Endeavour' have long since passed away, probably before 1970 to keep them in line with the fate of their progenitor. And so either one of them (I'll leave that choice up to your own whims) could have become a ghost, a spirit, fated to haunt the Oxford environs for the decades to come. Not only that, but he also was something of a quantum leaper - able to leap into the body of someone living. Being members of the Trueniverse audience, we see these people now in the image of the ghost, but it would not be noticeable to others within the Toobworld reality. Perhaps the ghost, whether it's the Don or the Porter, remembered Endeavour Morse back in the 1960s and was interested in keeping tabs on his later investigations. 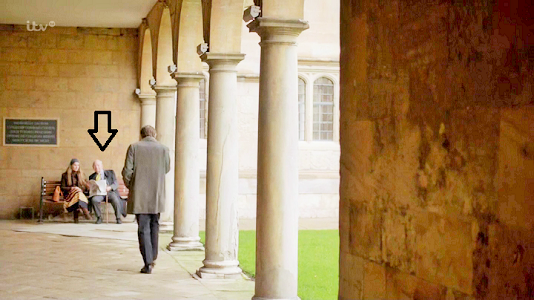 After the passing of Morse, the ghost then crossed over to the Other Side, for he is not seen in 'Inspector Lewis'. (Remember, most of those characters were of Colin Dexter with the other two being the Don and the Porter, next generation. So there you have it, my Toobworld-styled tribute to the memory of Colin Dexter and the incredible characters he either gave us or inspired. BIG SCREEN TV - "PILLOW TALK"
Toobworld has always been great in providing fictional movies only found in the TV Universe. But the movies we would see at the local cinema are also available In Earth Prime-Time. However, sometimes there could be differences between the movies we see and the versions over there. 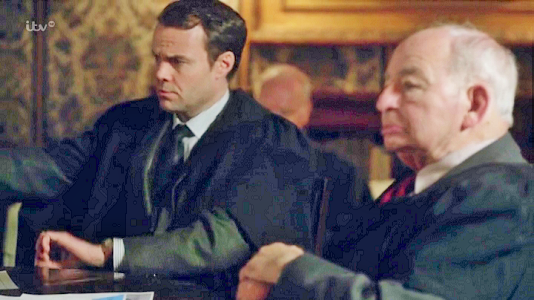 But it's not often we get to see clips from those movies within the framework of a TV series; at best we get to hear the dialogue - like "It's A Wonderful Life" as heard in the 'Father Dowling Mystery' episode "The Ghost Of A Chance Mystery". Certain movies though one would expect to see in Toobworld, either on a character's home TV or in the cinemas. A good example of that would be "Titanic" as seen in 'Movie Stars'. Remember that moment when a body bounced off the ship's propeller? That was supposedly hapless actor Todd Hardin. The latest example is "Pillow Talk" which starred Rock Hudson and Doris Day. 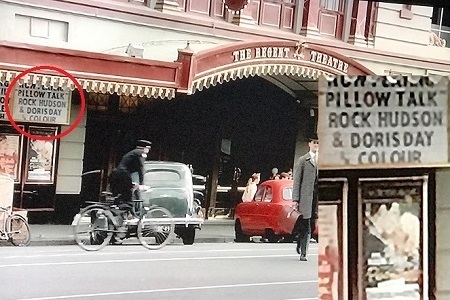 This split-screen shot was seen on Daisy's TV in the "Labor Of Love" episode of 'Madam Secretary' when the FBI arrived to search her apartment. Joan says she feels like she is stuck somewhere between Doris Day in "Pillow Talk" and "Midnight Lace". All that information comes from the IMDb. We know that Rock Hudson and Doris Day are in the movie, thanks to that screen grab, but there could always be differences between the real movie and its "televersion". 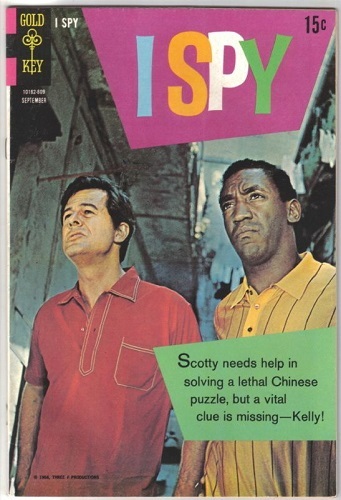 Maybe there was an alteration in the script, although we know from 'Columbo' that Rock Hudson's character would survive - you don't kill off Rock Hudson. 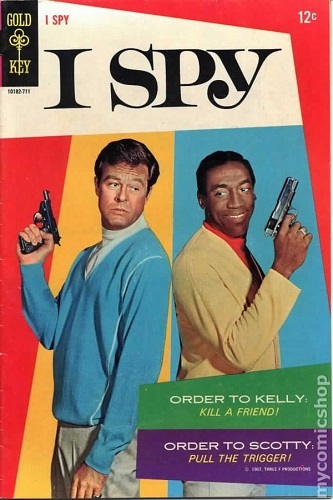 But some of the other actors might have been recast, perhaps even with some fictional actors like Sam Garrett ('The Hero' of 'Jed Clayton, US Marshal'). André Simon (28 February 1877 – 5 September 1970) was a French-born wine merchant, gourmet, and prolific writer about wine. Hugh Johnson describes him as "the charismatic leader of the English wine trade for almost all of the first half of the 20th century, and the grand old man of literate connoisseurship for a further 20 years". He wrote 104 books during his 66-year writing career. As a Frenchman, his English prose was heavily influenced by the man who gave him his first break in writing – A. S. Gardiner of the Wine Trade Review. Simon once described a wine as "a girl of fifteen, who is already a great artist, coming on tip-toe and curtsying herself out with childish grace and laughing blue eyes." Hugh Johnson has called Simon's "figures of speech and choice of phrases deliciously oblique"; Michael Broadbent admires the "pure poetry" of his writing, calling Simon his favorite writer. André Simon died in 1970. He believed that "a man dies too young if he leaves any wine in his cellar"; there were only two magnums of claret left in his personal cellar at his death. On what would have been his 100th birthday in 1977, 400 guests gathered at the Savoy to drink to his memory with Château Latour 1945 that he had left for the occasion. Despite living in England most of his life, he remained a French citizen and was an Officier de la Légion d'Honneur as well as a CBE. 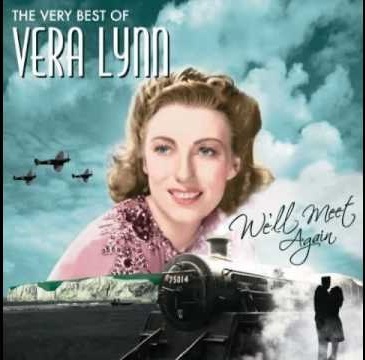 So singer Vera Lynn hit the century mark. God bless her. She remained popular after the war, appearing on radio and television in the UK and the US and recording such hits as "Auf Wiederseh'n Sweetheart" and her UK Number one single "My Son, My Son". Her last single, "I Love This Land", was released to mark the end of the Falklands War. In 2009, at age 92, she became the oldest living artist to top the UK Albums Chart, with "We'll Meet Again: The Very Best of Vera Lynn". She has devoted much time and energy to charity work connected with ex-servicemen, disabled children, and breast cancer. She is held in great affection by veterans of the Second World War to this day and in 2000 was named the Briton who best exemplified the spirit of the 20th century. Lynn celebrated her 100th birthday on 20 March 2017. I think it could be its use at the end of "Dr. Strangelove or: How I Learned to Stop Worrying and Love the Bomb" in 1964 which propelled "We'll Meet Again" to the front of the line when it comes to her best-remembered songs. In most of them, Vera Lynn went uncredited. So here's to you, Ms.Lynn. Congratulations on reaching your centenary, and also for your latest recording! Robert James Waller, whose bestselling, bittersweet 1992 novel "The Bridges of Madison County" was turned into a movie starring Meryl Streep and Clint Eastwood and a Broadway musical, has died in Texas, according to a longtime friend. He was 77. Waller died early Friday at his home in Fredericksburg, Texas, said his friend Scott Cawelti of Cedar Falls, Iowa. He had been fighting multiple myeloma, a form of cancer. In "Bridges," which Waller famously wrote in 11 days, the roving National Geographic photographer Robert Kincaid spends four days romancing Francesca Johnson, a war bride from Italy married to a no-nonsense Iowa farmer. Waller's novel reached No. 1 on the New York Times bestseller list and stayed on it for over three years; the Eastwood-directed 1995 movie grossed $182 million worldwide. 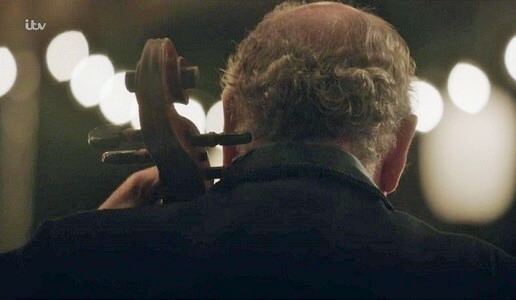 I never expected Waller to play his own televersion in some TV show. Writers like Mailer, Vidal, Anne Rice, sure. But I was surprised that the IMDb doesn't even list any talk show appearances by him. But still we have to accept that his televersion definitely exists in Toobworld and several of its alternate dimensions. And that's because there have been so many mentions of the book and/or the movie. The following information... information... information comes from the IMDb. I'll start off with those shows which only mention that the movie/book was mentioned, and then move on to more specific references. Mark Pitta admits to crying during this movie. Del tells Annie that they didn't have "The Bridges of Madison County" at the video store, so he got "Dumb & Dumber" instead. Kelly: "Look, Dad, why don't you take Mom to go see 'The Bridges of Madison County'? 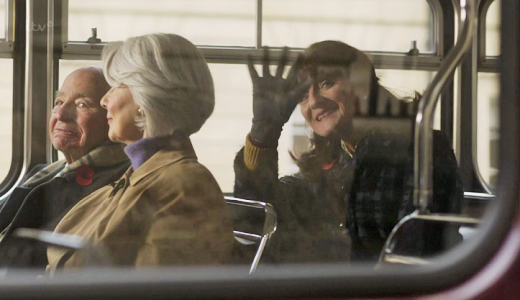 I heard, there's a new director's cut with 11 extra minutes of Clint Eastwood sponge-bathing Meryl Streep." Annie asks Hayward about it, he says he hated it. When Caroline doesn't want to wax Del's shoulder, he says he sat through "The Bridges Of Madison County" for her. Harvey says he rented the film. 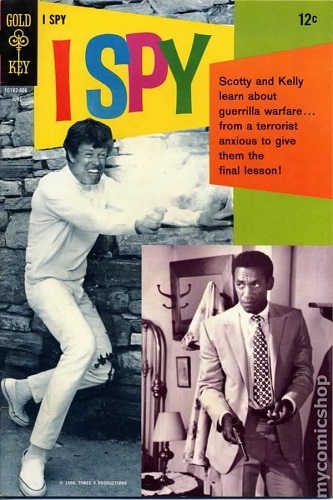 Cassidy mentions this movie and the book it was based on is mentioned by Jefferies. Lorelai equates Rory to Meryl Streep and her grandparents to "The Bridges of Madison County". Charlie and Alan watch it. Brent mentions that he saw the movie. Beau Bennett first mentions the novel and later on claims he has seen the film. There is a TV dimension in which the same events are played out over and over again and where the DNA of the residents of that dimension changes with each replay. It is called "ToobStage" and is a world of artifice, usually played out on stages. The leads were played by Alain Delon and Mireille Darc. So good night and may God bless, Mr. Waller. No matter what you might think of the book and movie, he will at least be immortal in Toobworld.